More than 1.9 million meals will be distributed to those in need in the tri-state area, including more than 772,000 in Connecticut, thanks to the generosity of the thousands who participated in this weekend's Feeding Our Families food drive. NBC Connecticut and Telemundo Connecticut viewers showed incredible generosity at nearly 90 Stop & Shops around the state on Saturday. As the donations were carried away by volunteers, they ended up at community organizations across the state. “We were trying to figure out where we were going to store all the food. This is not normally where we store food,” said Sara Conner, chair of the Fern Street Ministry Advisory Team in West Hartford. 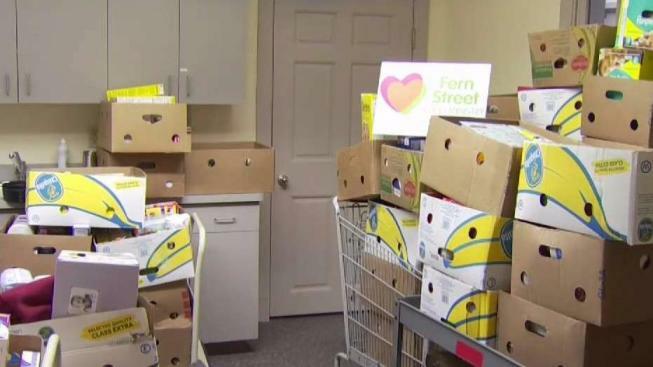 Box after box full of generous donations now fill an office used by the Fern Street Food Ministry based at The Universalist Church in West Hartford. “Having all this food to give away to those people who are in need is gratifying,” said volunteer Maria Sgamboti. Fern Street alone is looking at 70 boxes full of goods, weighing some 1,700 pounds. All of it was collected at the Stop & Shop on Newington Road in West Hartford. “It’s overwhelming. You know our community is so generous,” Conner said. The food will start heading out to kids in need as soon as this week, according to Conner. Much of what was given will also help pull off a big distribution in a few weeks. “In our pantry event, we might give out 1,400 pounds of food. So this would cover that. And that would be 50 families, well over 100 people,” Conner said.